Do you have a tough time choosing between firmness options? Do you share your mattress with someone whose sleep needs are very different from yours? 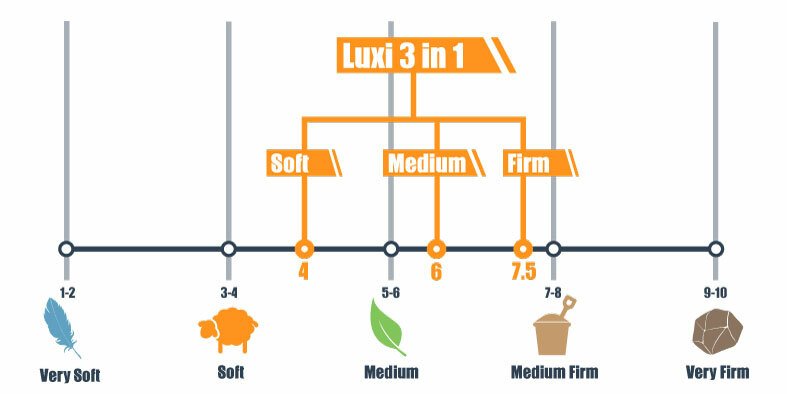 With Luxi, there is little need to commit or compromise on firmness. You can adjust this bed to Soft, Medium, or Firm at home by flipping the foam layers or changing their order. In Queen size and larger, both sides may be customized, catering to the sleep needs of you and your partner with 9 different configurations! 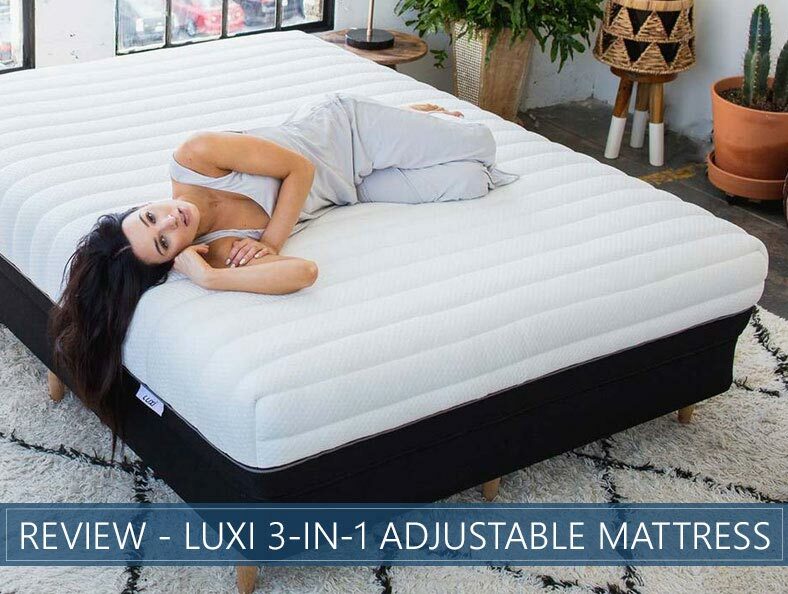 Our in-depth review of the Luxi 3-in-1 Adjustable Mattress will walk you through the bed as it comes straight from the manufacturer, but Luxi will also work with you one-on-one to further tailor their product if needed. Additional adjustments or layers can be added over time to accommodate changes in your body, such as sports injuries, pregnancies, or fluctuations in weight. Luxi believes that customization reduces waste. Over 20 million mattresses and box springs are discarded every year, and most of these end up in a landfill (source: greenbedrecycling.com). By working with their customers individually, Luxi hopes to reduce the number of beds needlessly discarded. To help you decide if Luxi is right for you, we scored the Medium configuration using our system based on features like support, pressure relief, durability, and value. Keep reading for our point-by-point analysis or jump here for the final summary and scores. Want a tailored sleep experience – Luxi is committed to fully-customizing your mattress. Not only can every bed be adjusted to three different firmness preferences, the company will work with you to make any adjustments to the layers and densities that your body needs to have a great night’s sleep. Are a couple – Luxi is one of the few bed-in-a-box options that allows you to customize both sides of the bed from home to accommodate different body types and sleep position preferences. Love all-foam designs – Luxi offers the great pressure relief and motion isolation we often associate with all-foam constructions with the added bonus of unique features that promote airflow and temperature regulation. Prefer innerspring mattresses – Luxi put a lot of thought into their construction to provide good support while keeping air flowing, but it will feel different from products that include coil systems, which are often associated with a lot of bounce. The Luxi is an all-foam bed-in-a-box option that is compatible with a number of different frames and foundations. You can use platform bases, box springs, as well as adjustable bases. The fully-removable rayon cover is quilted into a 1-inch layer of slow-responding memory foam, which gives the top a plush, luxurious look. A thick and durable polyester fabric covers the base. When you unzip the cover, you will see the mattress in two distinct pieces. The mattress’ foam layers can be flipped or reordered at home depending on your firmness preference: Soft, Medium, or Firm. Flipping the top piece over changes the feel from Medium to Soft. Putting the second piece on the top changes the feel to Firm. In sizes Queen and larger, each layer is split in half so each side of the mattress can accommodate different preferences. You should not feel the split through the 1-inch quilted cover, but if you prefer, you may custom order Luxi without the split. Furthermore, the company is willing to work with you to custom design the thickness and densities of their foams or include extra inserts to best suit your body size and type. All four layers and the cover, which together measure 11 inches tall, are made with open cell foams, meaning they promote airflow and heat-regulation. The first layer is 1.5 inches of proprietary LuxiTex foam, a springy and heat-resistant open cell synthetic latex that is specially designed to promote cooling and provide support. This proprietary material is safe for sleepers with latex allergies and is aerated to allow for better airflow. The second layer is 1.5 inches of adaptive transition foam, a visco-elastic pressure-relieving material that forms a transition between the next Support Balancing Technology layer and the LuxiTex. 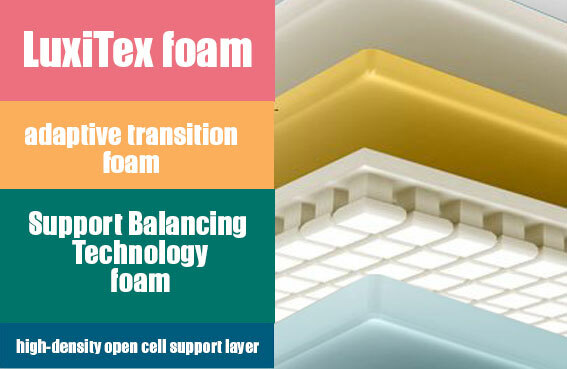 The third layer is 3.5-inches of open cell foam that the company calls Support Balancing Technology. It has a unique structure that uses small pods, or pedestals, of durable visco-elastic foam laid out like a grid that resembles coils but functions to conform to your body’s curves, providing pressure relief and support right where you need it. This configuration also forms channels for air to flow freely, which helps keep the foam from overheating. The fourth layer a 3.5-inch high-density open cell support layer of polyurethane foam that forms the foundation of the bed while providing support and stability for the sleeper. We scored the Medium setting of this bed at 6 out of 10 on our firmness scale (you can see how that works here), with 10 being the firmest. If you prefer a softer or firmer mattress, you can adjust the foams at home by unzipping and flipping the layers inside. These alternatives are scored a 4 and 7.5, respectively. The cover of this bed feels soft and plush and lets you sink through a layer of slow-responding memory foam to the more quick-responding and supportive LuxiTex layer below it (in the Medium configuration). The real star of this construction is what the company calls “Shape Matching Technology.” Because each foam pedestal of the Support Balance Technology in the third layer can move in multiple directions, this foam can adjust to cradle practically any shape and responds to support differences in weight and relieve pressure in both the heavier and lighter parts of your body. This uniform sinkage also helps to keep your spine in neutral alignment. There is a mid-level bounce in both the quick-responding LuxiTex and base layers. The bounce and overall support help with easy repositioning. Though your body is gently cradled, you really should not feel stuck. Combination sleepers, in particular, will appreciate the Medium setting since it is easy to move around on and quite accommodative. Most back sleepers will be well supported by the Medium setting that helps keep the spine straight and contours to the lumbar region. Significantly heavier back sleepers may feel they need the additional support of the Firm setting, and sleepers who are significantly lighter may prefer the Soft if their weight is not sufficient to penetrate the layers for contouring support. Most side sleepers will enjoy the cradling pressure relief that takes the stress off their hips and shoulders often experienced in this position. Those wanting a little extra pressure relief and a deeper hug in the foam, such as sleepers who are significantly lighter and have difficulty penetrating the supportive LuxiTex, may want to try out the Soft setting. Most stomach sleepers will feel well-supported by the Medium setting, which offers a lot of comfort without allowing their hips to dip too low. However, substantially heavier stomach sleepers may find that the Firm setting keeps their spine in better alignment. The Medium setting of this mattress will accommodate the widest variety of sleepers, and the company even suggests that everyone try the bed in this setting first before opting for the alternate configurations. Mattresses with a lot of foam tend to do well in this area because they have less bounce than beds with coil systems and work well to absorb motion and keep it isolated. The Luxi’s all-foam construction minimizes movement and reduces motion transfer really well. How a bed handles motion transfer is important for couples sharing space who worry about disturbing their partner when they change positions at night or get in and out of the mattress. The unique design of Luxi’s Support Balancing Technology provides additional support around the edges, improving the edge support slightly from what we typically expect from bed-in-a-box all-foam mattresses. The memory foam pedestals around the edges are reinforced to offer additional support so when your weight settles on the edge when sitting you still feel the cradling compression, but away from the edge so you are cradled back into the mattress rather than pitching forward. Lying down on the side of the bed, you can still feel the pressure relief of the pedestals, but the reinforced row and the supportive base layer should hold you in the bed without that feeling like you’re going to roll out. 1,000 Night Pledge – If you are not 100% happy with your sleep on the Luxi, a sleep consultant will work with you to make adjustments to your bed or further customize the foams to fix the problem. With their 1,000-Night Sleep Pledge, the company will work with you for free for 1,000 nights. After that, adjustments are available at an affordable additional price. Trial Period – The company offers a 100-night sleep trial that lets you try it and make sure it’s what’s best for you, or return it for a full refund. Warranty – This product comes with a 10-year warranty. Shipping – The Luxi ships for free anywhere in the continental U.S., as well as to Alaska, Hawaii. Shipping to Canada is available for a small surcharge. They will also work with third-party organizations to remove your old mattress, but this may incur an additional charge in some areas. CertiPUR-US® Certified – A third-party organization performs rigorous tests on foams to guarantee safe or nonexistent levels of ozone depleters or harmful chemicals and metals like lead, formaldehyde, and mercury. Charity Initiative – The company is committed to being part of a change that makes the world live and sleep better and will give a portion of every sale to a charity. During checkout, you can choose from a selection of organizations such as the American Red Cross, The Humane Society, and Habitat for Humanity. The Luxi 3-in-1 Adjustable Mattress is one of the most versatile beds we have ever seen and offers truly customized comfort to suit almost every preference. With Luxi, you are probably not going to have to compromise to get a great night of sleep because the customizations on this luxury bed seem endless. The high-performance design and high-end materials were engineered to adjust to most sleepers. The company’s Shape Matching Technology mirrors and adapts to virtually any body shape imaginable. If you try the at-home adjustments and still think it is not right for you, the company will work with you until you find a solution that best fits your individual needs. If your needs change over time, the company is happy to help alter the bed to suit your changing needs. Life changes pretty fast, and now there’s a mattress that can change with you. How Often Should You Flip (Rotate) Your Mattress? What’s the Best Time of Year to Buy a Bed in 2019? At your size, you might consider starting with Luxi while firmer, but this is largely a matter of taste and you should sleep in whatever configuration makes your back feel like it’s straight. This can be more difficult for curvier folks. If you’re interested, you might check out some of our best lists to see what mattresses work best for heavier side sleepers. Best of luck to you, and thank you so much for reaching out. I hope you find the best mattress for you! Let’s start with the good, the bed. It’s very well made and easy to adjust. I will say that the softest setup is not all that soft compared to some of the other options out there. Now for the not so good……horrible customer service so far. When we ordered our bed in January the site says “ships in 3-5 business days”. At checkout I got a popup that said “due to current demand your bed will ship in 5-7 business days”. It was ordered on Jan. 7th and was delivered on Feb. 1st, about 20 business days later. During that time no one ever answered the phone and the response to email was slow at best and I was mis-informed several times on the status of my order. On 3/12 I emailed them about arranging a softer setup for my wife and so far they have yet to respond more than 2 weeks later. I think I’d think twice before doing business with Luxi. + PROS: Well made. Easily adjustable. - CONS: Lack of customer service. Not overly "soft" with softest setup.